$7.99 & FREE Shipping on orders over $59. Keep your yeast healthy and happy with the nutrients it needs to make great beer! Yeast nutrients help prevent off-flavors, decrease fermentation time, and increase alcohol potential. Nutrients are especially important when making high gravity beers. Yeast starters offer higher cell counts at the time the yeast is pitched, leading to faster, healthier fermentations and better tasting beer! A higher cell count is especially important for lagers and high gravity beers. 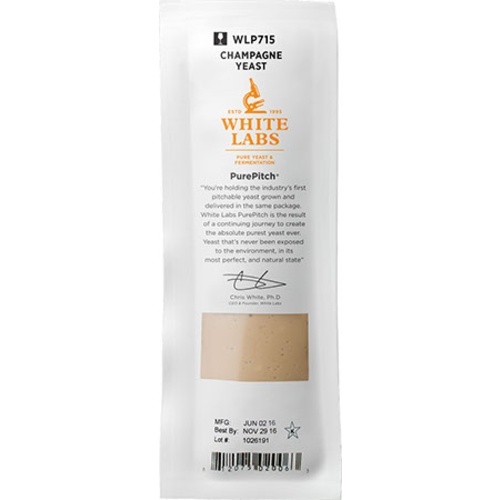 WLP715 is a classic Champagne Yeast used to make champagne, cider, dry meads, dry wines, or to fully attenuate barley wines/strong ales. A clean, neutral yeast. Please Note: For best results we Always recommend ordering an Ice Pack with your liquid yeast. Ice Packs can be found below in the "You might Also Need" section. BEST ANSWER: Hello Antonio - That is one big mutha of an RIS. Not sure if this is suitable for adding to the fermenter but may help break down stubborn sugars. You will also likely need a very strong culture to withstand the residual alcohols present. Best of luck! I would assume that if the Champaign yeast had no effect then your wort is fully fermented. Being within .01 of the anticipated FG is pretty darn close for a homebrew. Also, depending on the sophistication of your measuring equipment, your readings are really just an estimate. I would just bottle that batch and get on with enjoying it. I would like to. It just taste rather sweet. Looking for options. I really appreciate your time Craig. Worked great. Love More Beer! Yes. We made a small batch of mead with this yeast and some local raw honey and it was amazing. It stayed super bubbly and kept some of the honey's sweetness and brought out the floral notes without being overly sweet. I've used this yeast with great results for dry meads. I've found it really lets the honey character come out. I started making 2L starters w/ honey and plenty of yeast nutrient and it knocked months off of my fermentation times. Also used it to finish up a few high-gravity ales. Brought my imperial stout down from 1.016 to 1.012 in just two weeks.